Located in unique Horsetown USA, Thrifty Horse has all of the brands you have come to know and trust. You can find excellent deals on new and used items for show and every day use! Thrifty Horse Consignment Shoppe now has a corral in front of the store for our customers to ride on in and shop. The corral is fully fenced and stocked with automatic waterers, as well as tie rails to accommodate multiple horses. Allow our friendly and knowledgeable staff to assist you in saddle fitting, rider out-fitting, and everything in between. Thrifty Horse offers full service blanket & pad repair and cleaning. This is an in house service. Drop your blankets and pads off -pick them up cleaned & repaired within 7 days. Thrifty Horse also has an in house tack repair shop. Quality repairs on all your leather goods. 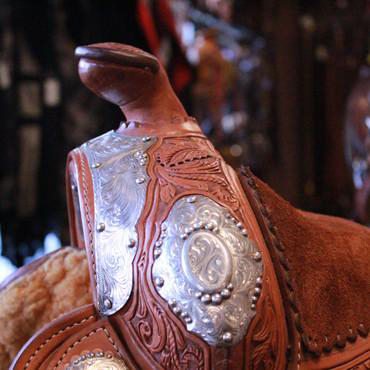 Largest selection of used saddles in Southern California! Clothes and equipment for your Mini!